July 2007 (1): Fountaining from a vent feeding the lava lake in Pu'u 'O'o. 28 photos July 2007 (2): Surface of the lava lake. 19 photos July 2007 (3): life of the lava lake. Lava close up - March 2006 (1). 39 photos Pu'u 'O'o's lava lake - March 2006 (2). 29 photos Lava sea entry and misc. from the VolcanoDiscovery tour March 2005 (3). 23 photos Inside a lava cave March 2006 (4). Halema'uma'u crater and more - March 2006 (5). Lava sea entry - Feb. 2005. 35 photos Various photos from the VolcanoDiscovery expedition Feb. 2005. Mauna Kea - Hawaii's tallest summit. 11 photos Colors of Hawaii, Big Island - miscellaneous photos (II). 35 photos Expedition to Hawaii Nov.- Dec. 2003. Erupting skylights and activity around Pu'u O'o. (Part 1) - 24 photos. Expedition to Hawaii, Nov- Dec. 2003. Erupting skylights and activity around Pu'u O'o. (Part 2) - 20 photos. New sea entry of lava flows. 15 photos Dec. 2000-Mar. 2001: Pahoehoe lava. 21 photos Dec. 2000-Mar. 2001: Miscellaneous photos (I). 21 photos Feb.-May 2001: Skylights and Pu'u O'o cone. 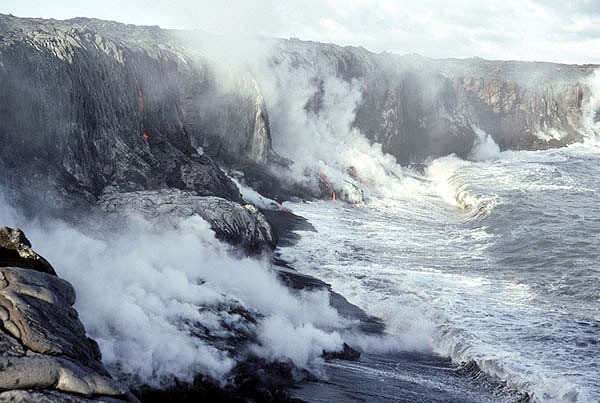 November-December 2000: Lava flow sea entry. 9 photos 18 December 2000: Lava flows on Pulama pali. 17 photos 29 December 2000 and 02 January 2001: lava flows. � Tom Pfeiffer, page last modified on 12 November 2007.